Although chia seeds are nutritious, there isn't a recommended amount you should eat. Research is still preliminary and conflicting on the potential health benefits of these small black seeds. However, studies involving chia seeds sometimes use a dose of 25 grams, which is slightly less than an ounce, a reasonable amount to eat in a day. An ounce of chia seeds, or about 2 tablespoons, contains 136 calories, 4.6 grams of protein, 8.6 grams of fat and 11.8 grams of carbohydrates. Only 0.9 gram of the fat consists of unhealthy saturated fat; the rest is unsaturated fat, including a high proportion of heart-healthy omega-3 fats. This serving also provides 9.6 grams of fiber, or 38 percent of the daily value. Fiber helps lower your risk for high cholesterol, heart disease, high blood sugar and constipation. Chia seeds provide significant amounts of micronutrients. Each 2-tablespoon serving has more than 10 percent of the daily value for thiamine, niacin, iron, copper and calcium and more than 20 percent of the DV for selenium, manganese, phosphorus and magnesium. Thiamine and niacin help you turn the food you eat into energy, and you need iron and copper for forming red blood cells. Calcium, manganese and phosphorus are important for strong bones; selenium acts as an antioxidant to limit cell damage; and magnesium is necessary for forming DNA. Although the evidence is based mainly on small studies and animal studies, chia seeds may help lower your risk for high cholesterol, high blood pressure and heart disease, notes the Academy of Nutrition and Dietetics. A review article published in the "Journal of Biomedicine and Biotechnology" in 2012 notes that consuming chia seeds may help increase your blood levels of the essential omega-3 fat ALA, help you lose weight and reduce your triglycerides and after-meal blood sugar levels. You can mix chia seeds with water to form an egg or oil replacement; sprinkle them into smoothies, cereal or yogurt to add fiber and nutrients; or use them to make nondairy puddings and thicken soups. Adding chia seeds to your diet may cause some gastrointestinal symptoms, such as gas or bloating, if it means a sudden increase in your daily fiber intake. Drink plenty of water and increase your fiber intake gradually to limit this risk. 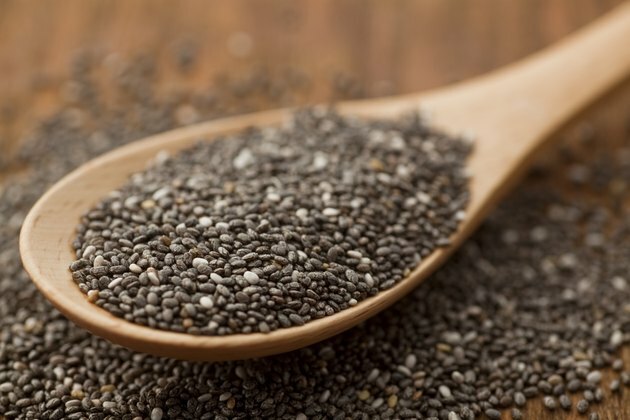 American Council on Exercise: Chia Seeds: The Newest Ancient Superfood? Does Brown Rice Cause Stomach Cramps?